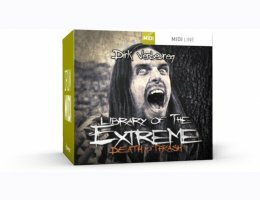 Welcome to the second installment in Dirk Verbeuren‘s display of the utmost in extreme metal drumming: Library of the Extreme – Death & Thrash. While its predecessor focused solely on all the thinkable variations of different blast beats, this library dives headfirst into the realms of death and thrash. Prepare for a virtual MIDI assualt of skank beats, carpet rolls and d-beats together with all the fills to go with them.